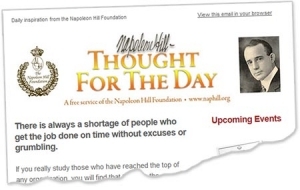 To receive Napoleon Hill’s Thought for the Day, just fill in your name and email below. This is a free service and you’ll receive occasional news from the Foundation. Thanks for signing up! Para recibir el Pensamiento del día en español, haga clic aquí.